Little Anthony & The Imperials were one of the greatest Doo-Wop groups of all time. This package features their two original 1950s LPs plus the majority of their single and EP releases, including, the original version of “Tears On My Pillow”, which was a No. 1 hit for Kylie Minogue in 1990. 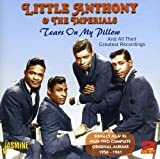 Still performing today, and one of the few groups to enjoy success into the 1970s, Little Anthony & The Imperials are definitely worth a listen and fully detailed liner notes covering their entire career top this set off nicely.